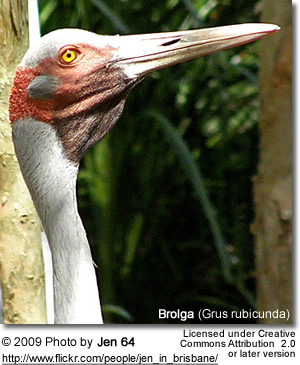 The Brolga (Grus rubicunda), formerly known as the "Native Companion", is a bird in the crane family. The bird has also been given the name "Australian Crane", a term coined in 1865 by well-known ornithological artist John Gould in his Birds of Australia. The Brolga is a common gregarious wetland bird species in tropical and eastern Australia, well known for its intricate mating dance. It is the official bird emblem of the state of Queensland. 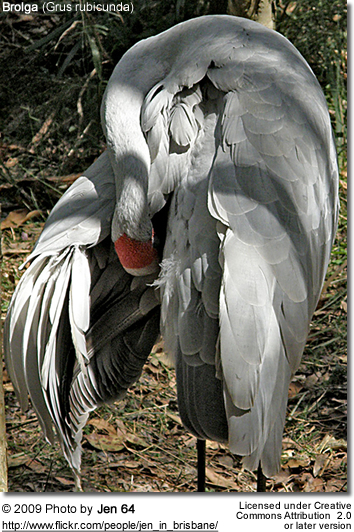 The full-grown Brolga is a tall, mid-grey to silver-grey crane, 0.7–1.3 m (3.3–4.3 ft) high, with a wingspan of 1.7–2.4 m (5.6–7.9 ft), and a broad red band extending from the straight, bone-colored bill around the back of the head. Juveniles lack the red band. Adult males average at a little under 7 kg (15 lb), females a little under 6 kg (13 lb). The weight can range from 3.7 to 8.7 kg (8.1-19.2 lb). The Brolga can easily be confused with the Sarus Crane, however the latter's red head colouring extends partly down the neck while the Brolga's is confined to the head. Additionally, in Australia the range of the Sarus is limited to a few scattered localities in northern Australia, compared to the more widespread distribution of the Brolga. Brolgas are widespread and often abundant in north and north-east Australia, especially north-east Queensland, and are common as far south as Victoria. They are also found in southern New Guinea and as rare vagrants in New Zealand and the northern part of Western Australia. The population is estimated at between 20,000 and 100,000. 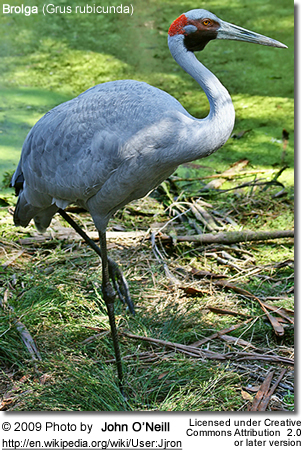 The International Crane Foundation began a captive breeding population with three pairs of wild Brolga that were captured in 1972. 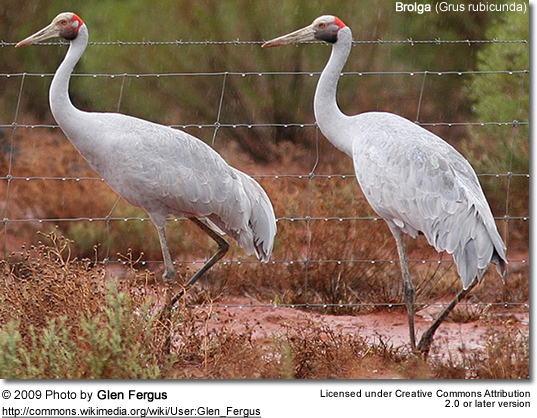 Brolga are non-migratory but do move in response to seasonal rains. The Brolga is listed as threatened on the Victorian Flora and Fauna Guarantee Act (1988). Under this Act, an Action Statement for the recovery and future management of this species has been prepared. On the 2007 advisory list of threatened vertebrate fauna in Victoria, the Brolga is listed as vulnerable. The Brolga is closely related to other cranes like the Sarus Crane of Australia and Southeast Asia, with which it can easily be confused. However the Sarus' red head colouring extends partly down the neck while the Brolga's is confined to the head. Additionally, in Australia the range of the Sarus is limited to a few scattered localities in northern Australia, compared to the more widespread distribution of the Brolga. The bird is also related to the OldWorld Common Crane, and, more distantly, to the Blue Crane of South Africa. Brolgas are gregarious creatures; the basic social unit is a pair or small family group of about 3 or 4 birds, usually parents together with juvenile offspring, though some such groups are nonfamilial. In the non-breeding season, they gather into large flocks, which appear to be many self-contained individual groups rather than a single social unit. Within the flock, families tend to remain separate and to coordinate their activities with one another rather than with the flock as a whole. Brolgas are well known for their intricate mating dances. The dance begins with a bird picking up some grass and tossing it into the air, catching it in its bill, then progresses to jumping a metre into the air with outstretched wings, then stretching, bowing, walking, calling, and bobbing its head. Sometimes just one Brolga dances for its mate; often they dance in pairs; and sometimes a whole group of about a dozen dance together, lining up roughly opposite each other before starting. The brolga breeds throughout its range in Australia and New Guinea. The time of breeding is largely determined by rainfall rather than the time of year; thus the season is February to May after the rainy season in the monsoonal areas, and September to December in southern Australia. The flocks split up and pairs establish nesting territories in wetlands. In good habitat, nests can be quite close together, and are often found in the same area as those of the closely related but slightly larger Sarus Crane. The nest is a raised mound, built by both sexes, of sticks, uprooted grass, and other plant material sited on a small island, standing in shallow water, or occasionally floating. If no grasses are available, mud or roots unearthed from marsh beds are employed. Sometimes they make barely any nest at all, take over a disused swan nest, or simply lay on bare ground. There is one brood produced a year, with clutch size usually two; the dull white eggs measure 95 x 61 mm and are sparsely spotted or blotched with reddish brown. The markings are denser at the larger end of the egg. Occasionally one or three are laid about two days apart. Both birds incubate and guard the young. Hatching is not synchronised, and takes about 30 days. The chicks hatch covered in grey down and weighing about 100 g. They can leave the nest within a day or two, have body feathers within 4 or 5 weeks, and are fully feathered after three months, and able to fly about two weeks after that. 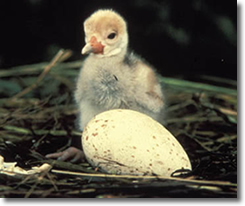 When threatened, chicks hide and stay quiet while the parents perform a broken-wing display. The parents continue to guard the young for up to 11 months, or almost two years if they do not re-nest. Brolga are omnivorous and eat a variety of wetland plants, insects, invertebrates, and amphibians. They also eat wetland and upland plants, seeds, mollusks, and crustaceans. Northern Australian populations of Brolga are fond of the tubers of the bulkuru sedge which they dig holes to extract but this is not available south of Brisbane. When first described by the naturalist George Perry in 1810, the Brolga was misclassified as Ardea, the genus that includes the herons and egrets. It is in fact a member of the Gruiformes—the order that includes the crakes, rails, and cranes, and a member of the genus Grus. The Royal Australasian Ornithologists Union made Brolga, a popular name derived from Gamilaraay burralga, the official name of the bird in 1926. The Brolga, Sarus Crane (Grus antigone), and White-naped Crane (G. vipio) were seen as forming a natural group on the basis of similarities in calls in 1976. This was further confirmed by molecular studies of DNA. It is unclear which two of the three species are most closely related.